I curl my hair almost every day. I love how I feel with a head full of curls. However, I travel a lot for work, and sometimes I feel like it’s not worth bringing my bulky curling iron with me. That’s all changed, now that I use a cordless curling iron. It’s saved me so much frustration, and gives me freedom when it comes to my style. If you’ve never used a portable curling iron, keep reading to learn how to use a cordless hair curler. You’ll be unplugged in no time! The Conair Minipro is powered by a ThermaCELL butane cartridge. It features ceramic technology that can help eliminate static and reduce frizz. It also protects hair from heat damage. It heats up to 410 degrees Fahrenheit and could be the perfect travel curler for you. I brought this curling iron on a camping trip. I know, who needs curly hair while camping? Me, I guess! It was super easy to use, even with a tiny compact mirror. I felt like I was the queen of the forest with my awesome curls next to the campfire. I bought the ThermaCELL Compact Curling Iron for my daughter. It comes with a carrying case that’s perfect for school. When she’s running late in the morning, she can spend a few minutes before the bell rings curling her hair. She says it heats up incredibly fast, and because she doesn’t need to plug it in, she can curl her hair just about anywhere. She’s curled it right at her locker before. It heats up quickly but also cools down quickly, so she can just curl and go. If you’re looking for a curling iron to keep in your purse for those curling emergencies, this is it. 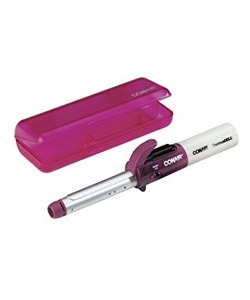 The Conair Travel Smart heats up to 360 degrees Fahrenheit and uses a butane gas cartridge to work its magic. It’s been approved for airline travel as well. Just throw it in your checked baggage and you’re good to go. The barrel is quite skinny, but it’s easy to create a stylish messy curl look on the go. Just be sure to remove the butane cartridge when you’re done, or you run the risk of it leaking. A cartridge should last you about a month with normal use and proper precautions. I had a really long business trip a few months ago and brought along the Conair Cordless. I was in about three cities each day for a variety of meetings and presentations. I was constantly on the go and didn’t have time to stand in front of the mirror and curl my hair, so I’m happy I had this curler with me. It heated up really fast and was easy to use. Maybe it was the change in scenery, but my curls seemed extra bouncy with this curler. Either way, I keep this curler out on my vanity now and use it more than my traditional plug-in curler, even at home. If you’re looking for the best cordless curling iron, this could be it. I had absolutely no complaints. One of my good friends was getting married and had her honeymoon planned in Europe. She and her new husband were going to backpack through about a dozen countries. I knew I could get her a blender for her wedding or something that she would actually use, like a travel curling iron. I went with the Mermaid USB Rechargeable Curling Iron. She didn’t have to worry about bringing backup butane cartridges. Whenever she charged her cell phone, she charged her battery operated curling iron. She has thanked me several times for the gift, because in every single picture taken at a landmark or historical site, her hair looks great! Even at those times when they weren’t able to shower for a few days or wash their clothes, her hair looked styled and neat. She’ll treasure those memories and pictures forever, and she’ll never have to say that her hair looked bad. Finally! Here’s a cordless curler that adds crazy volume and eliminates frizz because of its curl brush attachment. This is perfect for weekend trips, long vacations, long days at the office, or just a simple day at home. It does just about everything you need it to do, without the limitations of a cord. If I want curly hair, I go for it. But if I just want crazy volume with subtle waves, I throw on the brush attachment and simply brush my hair until it shines. I then take it off (carefully) and curl the ends of my hair towards my face. It looks professional and cute all at the same time, and I can do it all while I watch the morning news. Why Do You Need a Cordless Curling Iron? Why make the switch to a portable curling iron? There are so many reasons! I couldn’t pick my favorite, so take a look at my short and sweet list. They’re all pretty persuasive! Because you need to use an alternate source of power with a cordless hair curler, you’ll find that the majority of the time, it heats up much faster than a traditional model. This saves you time in the morning and gets you out the door in record speed with gorgeous curls. How many times have you been curling your hair and found the cord in your way? Now you can curl from any angle without having to worry about getting tangled up. You can even walk away from your vanity for a second if you forgot to grab hair spray or other styling tools, without having to stop your curling. I love that I can bring my travel size curling iron just about anywhere. It takes up less space in my suitcase (leaving me more room for travel size hair products), and I don’t have to worry about not being able to plug it in because of different outlet setups when I travel overseas. It’s just one less thing to worry about when I’m away from home. There are two main types of cordless curlers. 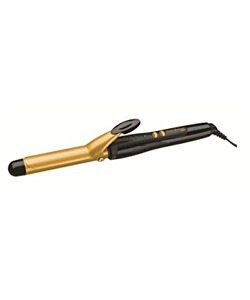 There are rechargeable curling irons, which either use disposable batteries or can be plugged in to charge as needed, and then there are butane powered curling irons, which rely on butane as a source of fuel. The more common power source is butane. 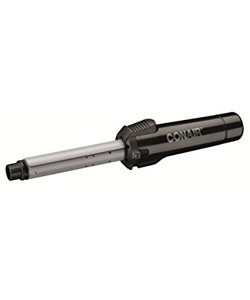 A butane cartridge is inserted into these types of curling irons, which heats up the barrel. One cartridge usually lasts for several uses, depending on how long it takes to curl your hair. Once the cartridge is empty, simply replace it with a new one. It’s always smart to make sure you have a few replacement cartridges available at all times, just in case one is faulty. Can You Travel on Planes with a Gas Powered Cordless Curling Iron? You can, but there are some stipulations. First, the cordless curling iron must be in your checked baggage. You cannot pack it in your carry-on bag. Second, you can only have one cartridge. The curling iron itself must have a safety cover over the barrel as well. Keep in mind that these guidelines can change at any time, so be prepared to part with your curling iron at the airport. I only travel with an inexpensive travel curling iron for this reason. If you take a look at cordless curling iron reviews, you’ll see that there are a few differences between the two types of style tools, which can be pros for some people and cons for others. Some people love how light a cordless curler is, while others want their styling tool to have a little more bulk. Some people don’t like the idea that they need to always have a backup butane cartridge or batteries with them at all times, while others would rather deal with the extra power source than worry about finding an outlet when they’re on the go. One thing that just about everyone agrees on is that whether you go with a cord or without, your curls will look great. Take some time to ask yourself what you do and don’t like about your current curling iron. Will getting rid of the cord solve any of your issues? Don’t just grab the first cordless option you see on the shelves. 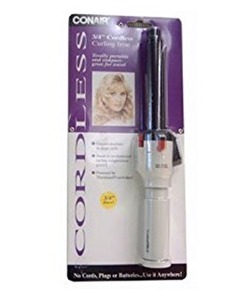 Just as it takes some time to find the best curling iron, it takes some time to find the best cordless version as well. Take a look at these quick tips that will help you find the best cordless curling iron for your needs in no time. If you want tighter curls, you’ll want a smaller barrel size. For large, voluminous curls, go with a larger barrel size. It’s difficult to find larger barrel sizes in portable curlers, but not impossible. You can also look for one with interchangeable barrels to give you the best of both worlds. If you have thick hair, you need a butane or battery operated curling iron that gets extra hot. But if you have fine hair, you’ll need one with a lower heat setting. Make sure your curling iron won’t damage your hair by checking the highest and lowest heat settings. Always make sure to use a heat protectant spray, as well. How often are you going to be using your cordless iron? If you’re going to use it on a daily basis, it wouldn’t hurt to spend a bit more. But if it’s something you’re going to keep stashed away for emergencies, you can find one with a pretty low price tag. A tourmaline heating plate is usually safer for your hair but comes with a higher price tag. A ceramic heating plate is okay for most hair types and can save you a bit of money. Cordless curlers are usually fairly basic, but there are still some fun features you can look for. 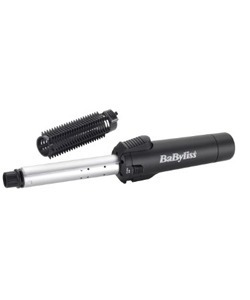 There are clipless models that allow you to wrap your hair around the barrel and eliminate the dreaded curl crimp. You can also look for crimping barrels or other barrels that give your curls a unique look. Brush up on your curling techniques with this quick guide. Don’t put your hair at risk by carelessly curling. Curling should be fun and safe! 1. Set up your counter or vanity. Gather brushes, hair accessories, and styling products. Turn on your hair curler. 2. Spray hair with a heat protectant spray. 3. Separate hair into two layers. If your hair is very thick, you might need three or four layers. 4. Hold the curling iron vertically. The clasp should be looking forward. Clamp a 1 to 2-inch section of hair. Slide the curling iron down to the end and curl hair up but away from your face. Get as close to the root as possible. 5. Hold in place for several seconds. Release and spray with hairspray to set. Remember that because there’s no cord, it’s easier to accidentally touch your neck or face with the curling iron. Always make sure you look at the curler’s position before rotating it to avoid burns. Also, make sure to turn your curling iron off before leaving the house. This can be difficult if you’re used to the automatic off feature found on most traditional curling irons. Most cordless options don’t have this feature. Once you experience the convenience of a travel size curling iron, you’ll wonder how you made it so far in life without one. They’re great for touch-ups at the office or between dinner and the movie on a date. They’re also a lifesaver when it comes to traveling. Stop limiting your curling options and get yourself a cordless curler today. No matter where you wake up, you’ll be able to style away!